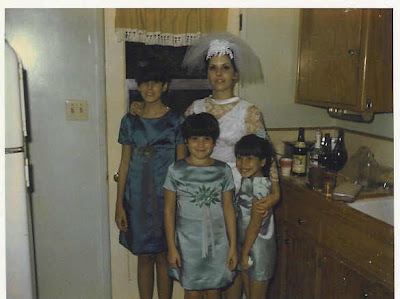 I absolutely had to share this picture of my Mom's first wedding day. She was 18 and such a trendy bride. I actually think the bridesmaids dresses (which are my Aunts) are still quite cute. My Mother's veil...not for me. Imagine what the Groom was wearing!